See why Bradford White water heaters are among the most wanted products for home water heating in North America. What is the best of Bradford White? Explore its popular electric and gas tank-type models including condensing and high efficient tankless, also advanced features and benefits. Bradford White Corporation is one of the three largest manufacturers of water heaters in US and Canada. BW produces many different models, types, and sizes that include several superior features for the efficient work increased performance, reliable and durable water heating operation. FVIR or Flammable Vapor Ignition Resistance is the system that can be found on all 30, 40 and 50-gallon gas models. Bradford White hot water heaters incorporate FVIR through the Defender Safety System, which includes design features and elements that safely resist the ignition of the flammable vapors outside the unit. The system complies with the industry standards so BW gas water heaters can successfully protect the users and property from the accidental ignition of the flammable vapors. ScreenLok flame arrestor design, made of the stainless steel for better stress, heat and corrosion resistance. The Eco-Defender Safety System also includes the latest burner design that ensures an ultra-low gas emission. This system allows Bradford White water heaters to heat water faster and provide longer unit life, by reducing the chances of the sediment build-up on its elements and bottom of the tank. Hydrojet Total Performance System is actually a dip tube or water inlet tube, which, due to its advanced design allows turbulent flow and efficient cold-hot water mixing. Those models that are built for high input applications utilize a Hydrojet 2 feature which has an improved sediment buildup protection system. 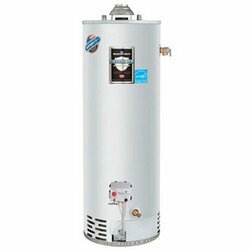 Every hot water heater with the metal tank must have a protection from the aggressive water action and corrosion. Bradford White water heaters are using Vitraglas, a high-quality glass tank lining that is applied to the inner surface of the tank, for better protection. The Icon System is the sophisticated gas control system that allows the enhanced heater's performance, better temperature control for the accurate and consistent temperature and intelligent diagnostic which includes the error codes for precise and faster troubleshooting. Many water tank heaters are using the plastic drain valve, while Bradford White utilizes the tamper-proof low restriction valve for faster draining and longer use. Draft diverter comes with the snap-lock mechanism so no need for the screws which makes the installation and service safer and faster. There are also several elements that are factory installed such as TPR valve and heat traps. The above features apply to tank-type models only. Bradford White offers a wide variety of heaters for residential water heating, which includes electric, gas, solar and oil-powered models. Based on the venting and installation options in your house, you can buy a gas water heater with the Atmospheric, Power Vent, Power Direct and Direct Vent system, which allows flexible installation in the garage, attic, utility room or inside the closet. For those who prefer conventional or standard type, tank-type heaters are what to look for. The available models are from the small 30 gallons, the most popular 40 and 50 gallons to over 100 gallons units. Other options include small, wall-hanging and Energy Star units for the tankless water heating. For the users with the special requirements such as; high demand for hot water, faster recovery, greater First-Hour Delivery, green technology, models for the mobile homes, Energy Star approved, Bradford White Corporation has it. Check out also the BW tankless heaters. Bradford White electric water heaters are also available as the tank-type and tankless or on-demand models. Tank-type water heater can be found from as small as 6-gallon unit to over 120-gallon models. The electric models can be found as the high-efficient units but are not Energy Star approved. The great advantage is actually the lower cost of the purchase and installation. Some models are designed with one or two heating elements. The only Energy Star compliant electric units from this manufacturer are coming from the heat pump series. Other types of water heaters include solar, oil and indirect water heating, plus storage tanks and units for combined space and domestic hot water heating. Bradford White water heaters are not sold directly to the end-user but through the dealerships and licensed technicians. According to this manufacturer, your water heater will be installed professionally and correct, per codes and manufacturer's recommendations. Correctly sized, installed venting, plumbing, gas and other elements ensure reliable and safe work.